P. Blankley *, V. Casser *, R. Janssen *, Technical report, Harvard University, 2017. This report summarizes a multi-step method for identifying full orbit trajectories of asteroids in our solar system. The input to this method is a list of partial ”tracklets,” a series of visible-light observations of an object in the night sky over the course of several hours. The output is a series of ”orbital elements” that completely define the asteroid’s trajectory through our solar system. Some steps of this method have been completed as a prior project and are outside the scope of this paper; specifically, (i) the partitioning of the night sky into 768 spatial regions and monthly time windows, and (ii) the initial clustering of asteroids within those regions/windows into ”asteroid slices”. The steps that are within the scope of this paper are (a) the optimization of the six ”motion parameters” of each cluster from a variety of optimization solvers, (b) performing refinements on the earlier clusters using the optimized motion parameters, (c) converting the motion parameters into time independent ”orbital elements,” and (d) meta-clustering the asteroid slices from different time/space windows into final asteroid trajectories. Ultimately, our algorithm correctly identifies 69.9% of just over 21,000 asteroids in a labeled dataset with an approx. 1% error rate of spurious asteroids. We hope to run this algorithm on a full, unsolved database of asteroids known as the Isolated Tracklet File (ITF). 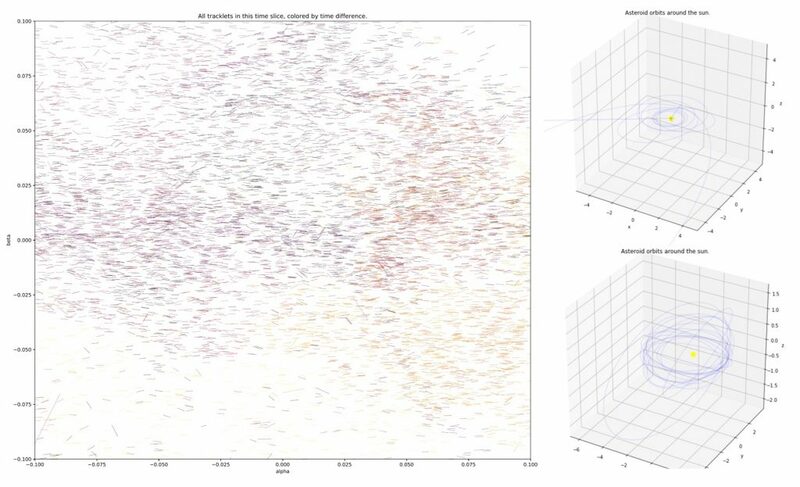 Left: tracklet density of one region in time/space on night. Right: examples of asteroid trajectories. 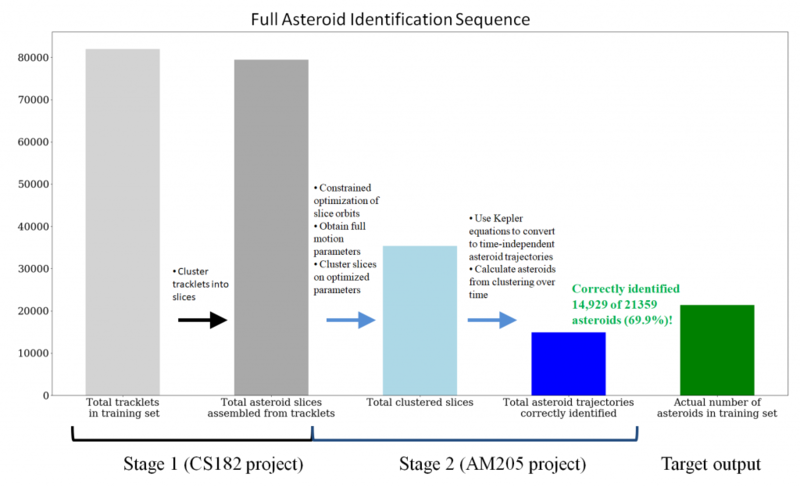 Full sequence of steps involved in identifying asteroids.